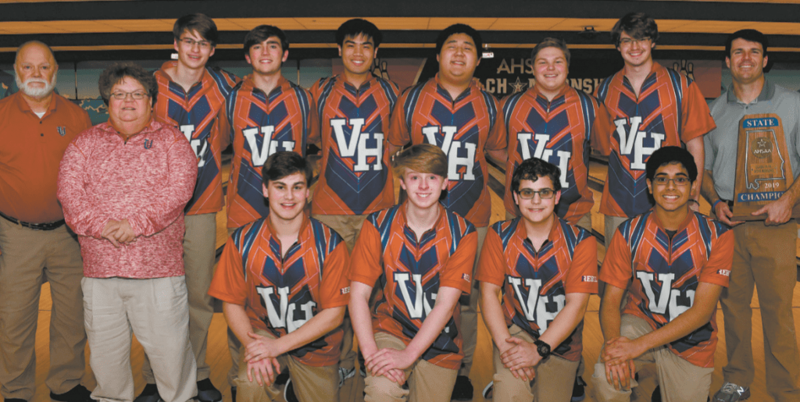 Members of the Vestavia Hills boys bowling team captured the school’s first bowling state championship by top- ping East Limestone on Jan. 24 at Oak Mountain Lanes in Pelham. Journal photo by Jordan Wald. Vestavia Hills captured its first boys bowling state championship by topping East Limestone on Jan. 24 at Oak Mountain Lanes in Pelham. A relatively new sport to state competition, the bowling championship has been recognized by the Alabama High School Athletic Association since just 2016. The championship includes all high school classifications, 1A-7A, allowing for the unique declaration of one true state champion. The Rebels have been quietly laying a strong foundation for their program, finishing as state runners-up each of the past two seasons. Todd Evans has served as the team’s coach for each of its four years, but he is quick to credit the teams that came before this one and how integral they were to reaching these heights – guys such as Travis Saunders, Will Evans, Sam Lawhon and Barret Blackwood. Lu and his fellow seniors, Cameron Monistere and Beau Reed, were driven by the desire to avenge those championship shortcomings on behalf of the teammates who have since graduated. Lu estimates that more than 100 enthusiastic Vestavia Hills bowling supporters went out to Oak Mountain to support his team. This team had a vast diversity in personalities, Lu said. Even more memorable for many among the group is how they came together under the leadership of Evans when they otherwise may have not done so. “This team is really special because we are all incredibly different, but we have created a family like no other,” Lu said. “It’s a miracle that we mesh so well. No other sport can bring these unique backgrounds together. That bond provided an outlet for Evans to teach his team about much more than competition, and the seniors who now move on from his program value those lessons. Reed believes that this group achieved great heights because of the focus instilled within him and his teammates by Evans. The seniors leave an everlasting mark on their school – the first class to ever achieve a state championship. It’s something that they’ll take pride in for years to come. And that’s still surreal. While they had all been a part of two teams that had finished second before, this is the team that reached the top and that is still new and a delightful surprise. But they will leave the program in good hands. Reed is confident that his younger brother, Walter, will be among those who carry the torch. The 2020 version of this team that will try to repeat will not only have the younger Reed, it returns its highest finishers in individual competition, Nick Watts, who placed eighth, and Mason Maners, who placed 20th. The future is bright for this still young program. “We seniors have driven this team to aim for the top,” Lu said. “Nick Watts has worked insanely hard this year to support the seniors. He knew how much we wanted this championship and wanted us to find that success.